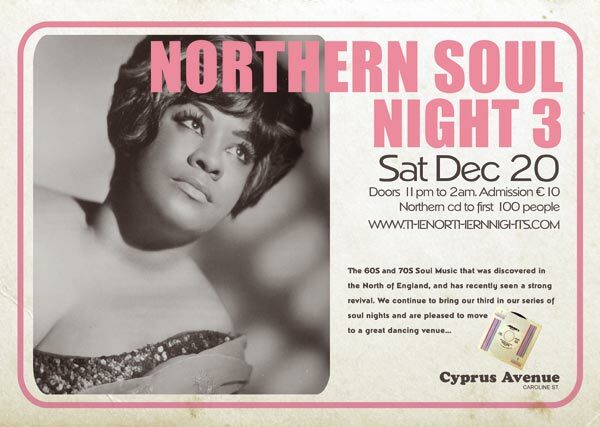 The third instalment of this new night of Northern Soul will be held in Cyprus Avenue this Saturday night. A Northern Soul Night 3 is our third in a string of nights being held in Cork. Previously at The Imperial Hotel, then the Victoria, we now move to a great dance venue â€“ Cyprus Avenue. Doors are at 11pm and open late night to 2am. Check out our site www.thenorthernnights.com for downloads and track info on artists of the day. Soul as deep as you likeâ€¦And then some. A scene that was originally open to the very few people has grown and grown. Sneered at by Londoners who thought they were in the know, but were actually, very much out of tune with regards what was happening in soul music during the late 60s early 70s in England. When the Motown empire was still growing, soul acts from the states would tour the Uk. Bringing with them not only a distinctive sound, but dance moves and fashion that the crowd would pick up on. From then on, the dance floor would be full of foot slides, spins and back-drops. Possibly the beginning of breakdance. Clubs such as the King Mojo or the Twisted Wheel would house hundreds of dancers, with several rooms with a couple of different resident Djs. These clubs could also hold live performances and the soul fans would be treated to a stage performance from some of the big names like JJ Barnes, Edwin Starr, Brenda & the Tabulations or even the Dramatics appeared live at the Torch Manchester. Now that was clubbing. October, at the Ã“ Riada Hall, UCC Department of Music, Sundays Well. artist from England, N. Ireland, California and elsewhere. The event will begin at 7:30pm and entry is free (recommended donation of â‚¬5). See www.busterandfriends.com/stet for more details. improvising musicians with varied experiences and from far afield. Music in providing a venue for this month’s event. Sat 17th Paddys day All day session with the Ceili All Stars , BBQ, Face painting and many more..
Sunday 18th Trad with Ceili all Stars and BBQ from 4pm and 8pm Jam Sesssion with an array of Cork’s finest Musicians. Saturday â€œSensual Saturday â€œ Electronic Beats with masters of the decks. 1st Saturday of every month Moonlight at the Attic room @ slainte provides musical Fusion & Electronic sounds til late. Word of Mouth Food served @ 8pm. Tickets â‚¬10 from Plugd Records. Every Sunday BBQ and Lounge music @ 6pm with an array of local musicians from Cork. Check out Slainte for a bit of Craic agus Ceoil! Purveyors of Wines , Beers, Spirits , Ales & Especially Tall Tales! A Feast not to be missed! Admission free for all gigs except Moonlight. Good news for fans of stand-up comedy, as regular comedy nights are becoming more established in Cork. Stand Up And Be Counted Comedy Club will set up residency in the Tikki Lounge on Little Hanover St. on the 27th of February, and continues every Tuesday with no cover charge. The Craichouse comedy night at Eddies Bar (formerly the L.V.) has been going strong for over two years. An established comedy club with an ever-evolving lineup, Craichouse also showcases new talent and has helped launch the careers of many aspiring local comedians. In the coming weeks, a new competition called “Craic me up” will see emerging talent battle it out for the chance to gig at the Kilkenny Cat Laughs comedy festival. Full details of upcoming lineups can be found on the Craichouse website. Cyprus Avenue will host a new monthly comedy event — Barrel O’Laughs — kicking off on Friday February 23rd with Ian Coppinger plus guests. Tickets at â‚¬10 are available on tickets.ie and from the Old Oak bar. The Lisa Richards Comedy Night is a touring co-op comedy night with a range of decent Irish talent on the books. For those down in wesht Cork direction, De Barra’s hosts its comedy night once a month, with Ardal O’Hanlon, David O’Doherty and Neil Delamere making appearances in the coming months. And of course there’s the mainstay of the Cork comedy scene City Limits Comedy Club, with a reputation for brining the major names to Cork down through the years. Upcoming highlights at City Limits include Eddie Brill, Omid Djalili, Matt Saddlier, Jason Byrne & Andrew Maxwell.